Do not exceed the recommended dose. This product is not intended for pregnant or nursing mothers or children under the age of 18. 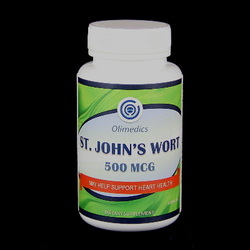 St. John’s Wort may contribute to photosensitivity resulting in skin irritation and redness in persons exposed to strong sunlight or tanning booths. If you are taking anti-depressant medications or have questions about the advisability of taking this product, consult your physician prior to use. Active ingredients: St. John’s Wort.